You know that feeling of using your intuition in a situation and having it work out beautifully. Do you wish you could create that experience any time you needed a solution or direction? Well, with practice you can! 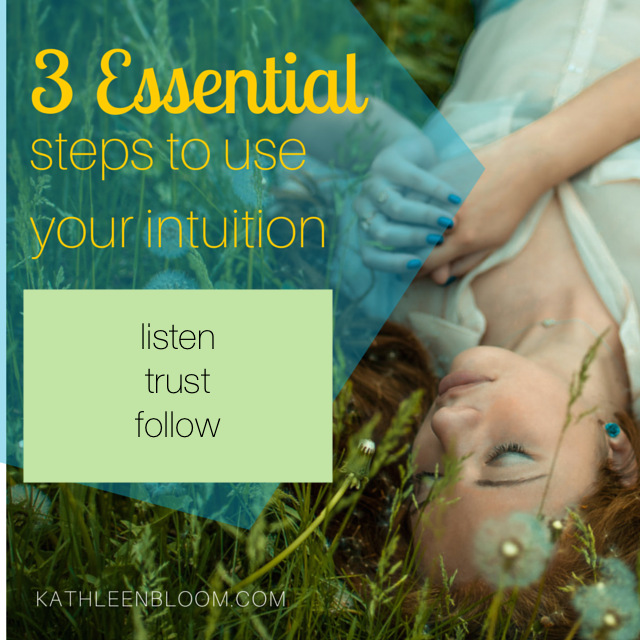 The steps to accessing your intuition are simple and easy. The key is to use them over and over again so you get comfortable with your natural ability to access your intuition. Take time to listen to your intuition with daily meditation. It can be a sitting meditation or a moving meditation. Having a time each day that you put aside to listen quietly to your deepest self is the lifeline of accessing you intuition. Once you have heard that inner voice of wisdom, felt that gut instinct, sensed a intuitive nudge – it is time to trust it. Trust yourself. Sometimes this is taking a big deep breath and giving yourself permission to proceed. Sometimes it can be as simple as affirming to yourself, “I trust my intuition.” Sometimes it is taking a leap of faith into the unknown – that is a big trust in yourself. Know this: You have the answer. You have the inner wisdom. You can trust yourself. You can trust your intuition. Now go for it! You have listened to your intuition. You have decided to trust it. Now follow it. Take action immediately when you get an intuitive direction. It can be a small act or a large one. But make sure you deliberately do something concrete to follow your intuition. Whether it is a phone call, an email, signing up for a class or moving forward on a business idea. The more frequently you use these three steps to access your intuition, the more natural it becomes and ready when you need it most. Keep listening, trusting and following your intuition.